Print a pdf version of this newsletter. Well, summer is over or just about over now depending on your location. Was it a good one for you and the children? I sure hope so. Despite my best attempts, I was unable to take them swimming as much as I and certainly they wanted. Nor were we able to get to an amusement park or visit our good friends in Alabama. But, one of the great benefits of homeschooling is that we can still do some of those things later in the year. However, we did spend seventeen days in SC with my parents and extended family, which was fantastic! Of course, being the educator that I am, it quickly became an educational experience as well as a really fun vacation. I took a hardcover book I picked up about family treasures and started to capture the memories from different relatives about our ancestors. Then, we can continue our study of genealogy after we return home. So, now we turn our focus to getting back to homeschool and keeping their interests alive. I will involve our children as much as possible in the homeschool lesson plans for the year and solicit suggestions from them of new things to do and others to be discontinued. If you are like most of us, you took time off from your regular homeschool curriculum and routines for the summer. Now, it’s time to get the children and yourself ready to return to homeschool. Just how do you do that? My suggestion is to start back slowly and not set yourself and your children up for failure by attempting to do too much too soon. Even if you intend to cover numerous subjects choose a few and begin with those first. Then, add others to the schedule over the next few days or weeks. Also, consider having a great “send-off” or bash at the start of the new year. We have a fun day of assigning new books and supplies and setting up our space at the start of our new season. And, sometimes we even conclude with root beer floats at home or a run to Sonic during their half-price hours! 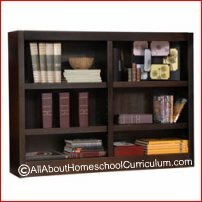 As you start homeschooling you will quickly acquire lots of homeschool curriculum and resources. It really helps to keep everything in a designated place for easy access for you and the children. In our home, we have discovered that separate zones tend to work best for us. All of my teacher’s editions, answer keys, and "homeschooling helps" books are kept in a separate area. I keep puzzles, Bingo games, Tangrams, Math-U-See blocks, Legos, and other games on a low bookcase that our children can easily reach. Each activity is kept in a clear, plastic tub that is labeled or has a photo of its contents. But, my favorite area and the one that requires the most of my attention is my homeschool materials closet shown here. 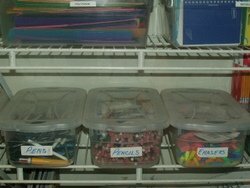 I have all our wire notebooks, composition books, glue sticks, pens, pencils, erasers, paint, and other supplies in this closet. The children have access to everything kept here and are also required to help keep this area tidy whenever it needs it. Is there a particular homeschool resource or new style of teaching that has piqued your interest? Are you thinking about trying a new resource? If so, what is it? Do you wonder whether your family is the unit study-type or want to change your spelling program? 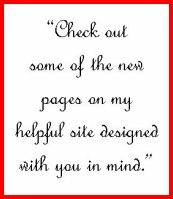 Share that new resource or idea with us on my site at the contact me page. Or, maybe someone else has some ideas or a review about how something worked for them. Before spending loads on money on trial resources though, try to get samples from publishers or definitely buy used on eBay, Amazon or similar sites. Once again it is that time when we should have sifted through ALL the great stuff out there and decided on the best homeschool curriculum available. We will also use a host of free homeschool worksheets and resources from the Internet to supplement and enrich our studies. Learn to use your curriculum as a guide but do not allow it to become a ruler over you and your family. Let me introduce you to my husband, Wayne. The Lord often uses him to teach me things about home education and family although I am the primary educator in the home. Q: What do you believe is the most important thing that the children learn during this upcoming school year? A: I think it is most important to make sure our children understand our basic Christian beliefs, can share them with others, and have a deeper, more personal walk with God. It is also important that the boys become better readers and more independent learners. The Internet is a great tool that they have at their disposal and I want them to also use it for things other than gaming. We should have them take standardized achievement tests like we did in the early years when we lived in CA. Testing them will show us any possible weaknesses and confirm their strengths. It would also be a good opportunity for them to have to perform their best under time constraints and give an objective evaluation of what they have learned. Next month, he shares an answer to what he feels works best to help keep me going whenever I need some "R & R" to prevent homeschool burn-out. Our youngest daughter, Naomi Jasmine, is a gymnast at a private facility in Franklin, TN. Gymnastics seems to run in our family because my husband Wayne was a competitive gymnast for many years up through college. Later, as an adult, he coached at private facilities in CA and TN. Our eldest daughter, Chenise, was also a competitive athlete, preferring Tramp & Tumbling over gymnastics, though. Recently, Naomi had her very first exhibition as one of the Shining Stars, a pre-team designed for children prior to making the full commitment of a competitive gymnast. Her events will be closer to home and the team expenses are considerably less than what would be expected from the competitive team. Nevertheless, she is having a blast and we really enjoyed watching her, too. Kudos to her coaches for doing such a fine job with the kids and helping me fulfill her PE requirements! I really wanted to share this incident and wasn’t sure where else to put it so I figured why not here! Earlier this month, I came home from vacation to discover that two of the three bookshelves we placed above an organizer in our school area had fallen down. What was I going to do? I resisted the urge to send our boys up into the attic in search of the plastic crates I knew were up there. I had vowed, “No more plastic” in my space no matter how practical they are. I have to get ready to start homeschooling NOW and don’t really have time for a long drawn-out construction project again this year. How about those heavy duty, industrial free-standing shelves found in Wal-mart and other stores, I wondered? I felt sure they could hold all my books. But, would I really want to see that metal tower every day? Probably, not. So, after two failed attempts to put shelves on a wall to create storage in a four feet wide alcove, it was time to do something else. My husband suggested we simply buy a pantry closet unit from Lowe’s and just move on. Apparently, he is just as interested as I am to get this situation over with and prepare for our transition back to homeschool. Off we went in search of the right piece of furniture to contain and conceal our stuff. It didn’t go as well as expected because most bookcases DO NOT have doors on them. Or, the doors were made out of glass which we definitely weren’t looking for that type. Also, most of them were not as wide as our space and I didn’t want to forfeit six inches on either side when centering a 36 inch wide unit on that wall. We spotted a nice wooden one with our desired width at a consignment shop. Office Depot also had a few options I noticed when I was purchasing some of their $0.25 composition books. I thought many of you could relate to this story and I will tell you the outcome in the next issue. Send me happy thoughts and best wishes as I continue searching.